Kuala Lumpur (VNA) – Nguyen Duy Tuyen bagged one more gold medal in pencak silat for Vietnam on August 29 at the ongoing 29th Southeast Asian (SEA) Games in Malaysia. Tuyen defeated Nur Alfian Juma’en of Singapore 5-0 in the tanding (combat) match of the men’s 75-80kg event. Shortly before Tuyen’s victory, Le Si Kien earned a silver medal in the tanding men’s 85kg, losing to Robial Sobri of host Malaysia. Meanwhile, Tran Dinh Nam and Pham Tuan Anh also pocketed silver medals in the tanding men’s 75kg and 70kg, respectively, both suffering defeat at the hand of the host country’s pencak silat artists. 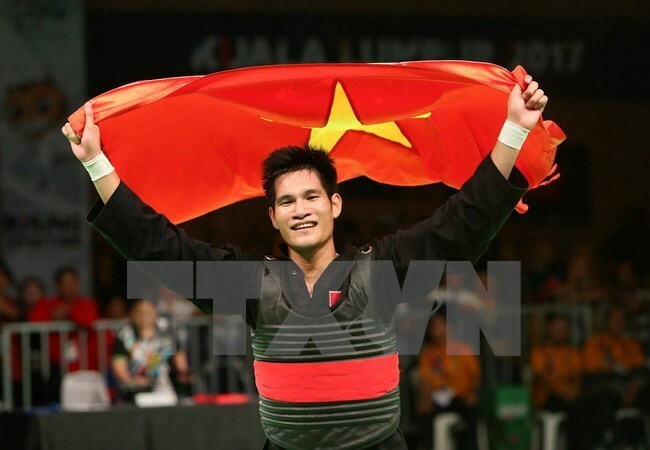 Nguyen Thai Linh, the world’s champion in tanding men’s 60kg, failed to defend his first position and brought home only silver. The same day, weightlifter Pham Tuan Anh earned a bronze medal in the men 69kg after lifting 306kg in total.